My name is Rodrigo Rodriguez. I am shakuhachi player from Balearic Islands,Mallorca. 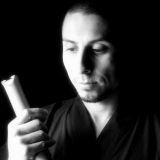 I recived my education of Shakuhachi from the teachers Kakizakai Kaoru and in these recent years from Kohachiro Miyata. I spend part of the year in Spain, teaching and performing, when i am not in Japan atending lessons with the master or doing some concerts. I dindt notice your post till today, I am sorry. I apreciate it, Thank you. I really apreciate your interest, and I hope you find some teacher in your country soon. I am teaching in Mallorca, and I have some students come from outside Spain, Germany. Do you study Martial Arts?